While checking out your lens candidates in Talk, I often found myself wanting to take a closer look at the images – usually to see if I can see a counter-image to the main lensed arc that you’ve flagged. This is not easy, because these counter-images are often fainter, and more central – closer to the lensing object – and this is where the light from the lens galaxy is brightest. 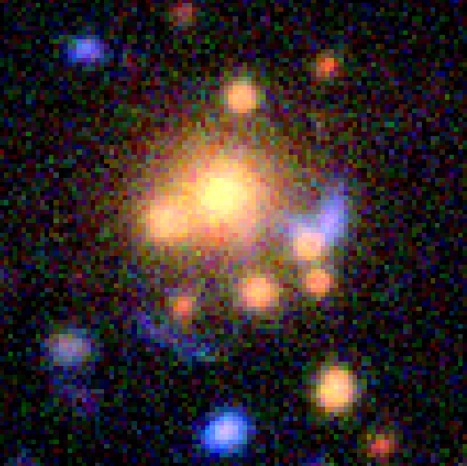 In almost all cases though, the lens galaxy (or galaxies) are yellow-red in colour, which means they are bright in the CFHT r, i and z bands, but not so bright in the g-band. 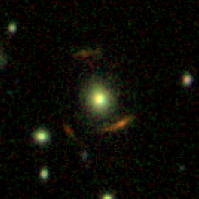 Meanwhile, the lensed features are usually blue – so brightest in the g-band. Sometimes it’s useful to be able to look at the different bands’ images individually, while sometimes you just want to be able to change the color contrast and brightness in the composite image. The Space Warps development team have given us a tool for doing exactly this – so in this blog post I thought I’d show you a couple of examples of where I’ve found it useful, and how you can use it yourself. For me, this is the best thing about this new tool: it allows us first to focus on a particular object in an image, and then show each other what we can see. Here’s another example: do you think this is an edge-on lens, in image ASW0005q6x? How about now, in just the g-band image? Simulations! They’re everywhere in Space Warps, sneaking into the images and popping up messages all over the place. They’ve sparked a fair bit of discussion in Talk – lots of people like them, some people find they get in the way, and we hear the same few questions a lot. In this post we have a go at answering them! Q: Why have we put all these simulated lenses in the survey images? A: The sims serve two purposes. The first one is training: since many volunteers in the Space Warps community may not have seen gravitational lensing in action before, the sims are there to help you become familiar with what to look for. They give you some first-hand experience in identifying gravitational lenses, and show you the common (and some uncommon) configurations of multiple images that gravitational lenses can form. The second purpose is driven by the science. We would like to find more new examples of gravitational lens systems that are known to exist in nature, but are difficult to detect. And because they are difficult to detect, we expect to miss some of them. That’s OK (we’re only human! ), but we’d at least like to understand which lenses we missed, and why! Some gravitational lenses could be missed for mundane reasons, such as lying close to the border of the image, for example. Other lenses which may have formed arcs could be missed if these arcs have very low brightness, or, because the lensed features are hidden in the light of the lensing galaxy, or if these lensed features are too red. Our aim is not to just discover lenses, but to be thorough and quantify what sort of lenses we might miss. 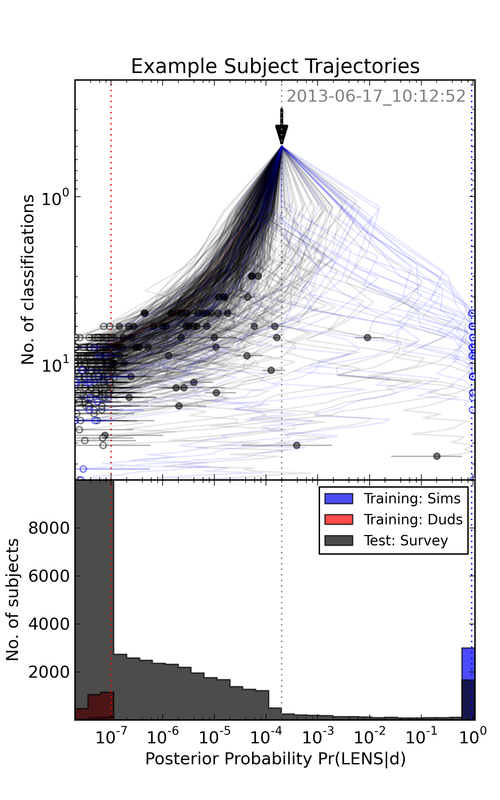 How well we find the sims will tell us how many lenses we likely missed, and which ones. Q: How did we make the simulated lens systems? A: As our goal of making sims is to generate a reasonable training sample that is also fairly realistic, we use realistic models both for the background sources and foreground galaxies. These models have some key properties that are largely enough to describe the wide range of lens systems that we have seen so far in the Universe. The mass, distance and shape of the foreground galaxies, and the colors, sizes, brightness and distances of the background galaxies and quasars all play an important role. We use realistic values of these key properties (and their interdependence), as measured by other astronomers in surveys like the CFHTLS. For each sim, we select a massive object from the CFHTLS catalog, and ask, what would this object’s image look like if there was a source behind it being gravitationally lensed? It’s quite difficult to select massive objects (measuring mass is one of the reasons we want to find more lenses! ), but we can make an approximation by selecting bright, red-colored objects (which for certain ranges of brightness and color are mostly massive elliptical galaxies). We then select a source, either from the CFHTLS catalog of faint galaxies (which includes estimates of brightness, colour, size and also distance), or from the known distribution of quasar brightnesses and colours. To mimic the distorting and magnifying effects of gravitational lenses, we create lens models from our understanding of the theory of gravitational lensing combined with observations of known lenses. We know of several hundred gravitational lenses now, and it turns out that in almost all cases, the details of the lensing effect can be described using quite simple models for the lens mass distributions. These lens models are then used to simulate the arcs, doubles and quads you see in the Space Warps images: in each pixel of the simulated image we compute the value of the brightness of the lensed features predicted by the model. The final step is to make sure that the simulated lensed features appear as they would in a real image. The Space Warps images were all taken with the Canada-France-Hawaii Telescope on Mauna Kea, and their resolution is limited mostly due to the atmosphere – we can tell how blurry the images are by looking at stars in the images. It turns out that the CFHTLS images all have roughly the same resolution, so we blur the lensed features by the same amount. We then add noise, and overlay the simulated lensed features on top of the image that contains the massive object we selected, so that the image looks as realistic as possible. Q: Should I mark all the simulated images, even if I have marked/seen them before? Why is this useful? A: Marking sims is very important – the analysis of the Space Warps classifications depends on it! We’ll blog about this process soon, but the central point is this: when we present a new lens candidate found at Space Warps to the rest of the scientific community, we need to estimate how likely it is to be a real gravitational lens system. This is tricky: the Space Warps classifications come from citizen scientists who have various degrees of experience and skill. We expect some people to be good at spotting faint arcs, others might be good at searching all the way to the edges of the images, while others might be better at efficiently rejecting objects that look like lenses but are not. 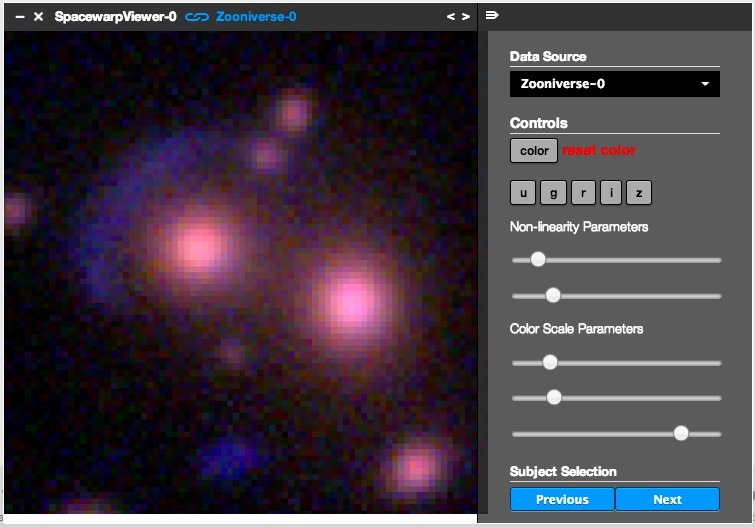 Our analysis software uses the simulated lens sample to quantify the collaboration’s expertise, and then assesses the likelihood of a lens candidate based on the classifications it has received. The uninteresting and less likely lens candidates are then “retired” from the database every day, so that we don’t have to look at them any more than necessary. Without the sims (and also the dud images, that are known not to contain any lenses), it would be much harder to estimate the likelihood of an image containing a lens, given its classifications. So please keep marking them, even if you’ve seen them before! Q. Can’t I turn the sims off? A. We thought about this – but when we were testing the site, we found that if we went for a long period without being shown a simulation, we started missing lenses because we were going too fast! So we decided to keep the sims in, albeit at a low frequency, to keep us on our toes! Q: Why do some sims look a bit odd? A: We use simple models to represent the lens and source galaxies; these simple models work fairly well in most cases, but sometimes they fail to capture some of the more unusual objects in the Universe. Since the whole process of generating sims is automated (so that we can make a large enough sample to get good statistics from) and we can only perform visual checks on a small sample, we do expect to have a few systems that may not look quite right. (a) Simulated arcs around nearby spiral galaxies. 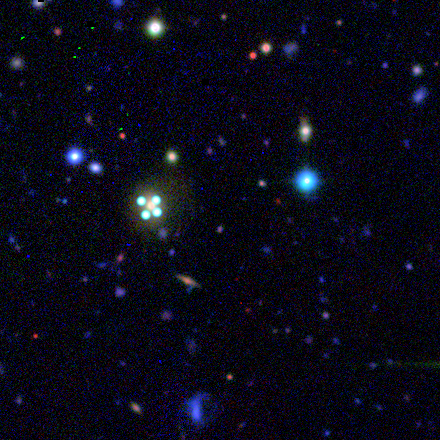 These are listed as having the incorrect distance in the CFHTLS catalog: they have the right brightness for a massive galaxy, but that’s because they are near, and not actually massive! They are assigned larger distances as the colour of their bulges is very similar to that of massive elliptical galaxies further away. Such spiral galaxies would have very small Einstein radius – but in the simulation, the arcs are predicted to be too far away from the bulge (i.e. the centre of the spiral) for it to be a plausible lens. (b) Abnormally thick arcs. This happens when the source is too big and bright to be a plausible background source. Again, this can happen if the source galaxy we drew from the CFHTLS catalog was listed with an inaccurate size. (c) Wide separation lenses around tiny galaxies. This can happen if the galaxy we are using as a lens is listed in the catalog as being brighter than it is (most likely due to inaccuracies in the inferred distance to this galaxy). Q: I see two lens systems in a single image (a combination of simulated and/or real lenses), what should I mark? A: Please mark at least one lensed image for each lens system: we need the simulated lens to be marked so that the analysis software knows you saw it, but then marking any real lenses will register that object as a potential real lens candidate as well. (Also, see the FAQ page on Space Warps). Q: How can I tell if I am marking a simulated or real image? A: You shouldn’t be able to, as the simulated images should give you a good indication of what a real lens should look like! You’ll know as soon as you hit “Finished Marking” though, because the Space Warps system always gives feedback straight away. Q: I see a simulated lens on top of a known real lens. What do I do? A: We have tried to exclude the real lenses from the simulated lens sample, but unfortunately all real lenses were not successfully excluded (Apologies!). This is not a matter of concern though: we’ll re-inject the images that were used in making the sims into the Space Warps database, but without the simulated lenses. For the time being, please continue to mark any or all of the lensed images that you spot, irrespective of whether you think they are simulated or real. The discussion of the sims in Talk has been really helpful – thanks for your questions, and for catching the problems mentioned above! Hooray! Space Warps is live, and the spotters are turning up in numbers. Check out the site at spacewarps.org – there’s a few little bugs that Anu, Surhud and the dev team are ironing out, but basically it’s looking pretty good! Thanks very much to everyone who’s helped out in the last few months – your feedback has been very useful indeed in designing a really nice, easy to use website that hopefully will enable many new discoveries. And to all of you who are new to Space Warps – welcome! If you’re feeling really keen, why don’t you come and hang out in the discussion forum at talk.spacewarps.org? We’re starting to tag images to help organise them, and the more interesting conversations we have there, the more useful it will be for the newer volunteers. And of course, you can vote on the candidates spotted by other people, by making your own collection. 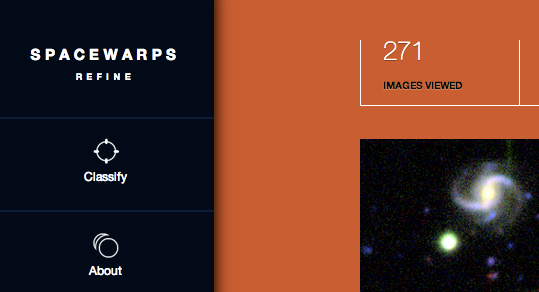 Come and take part in the Space Warps collaboration! PS. Aprajita and I will be making a special guest appearance on the regular Galaxy Zoo Hangout tomorrow – tune in for more slightly distorted spacetime chat! 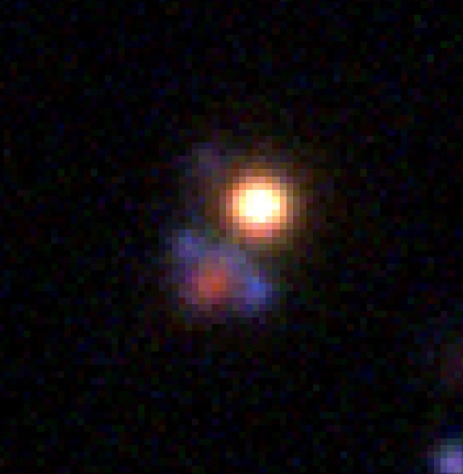 A simulated lens quasar, the likes of which we hope to find during Space Warps’ first project. Our first project is to search the 400,000 images of the Canada France Hawaii Telescope Legacy Survey, or CFHTLS – we’re asking people to spot gravitational lenses in its images, in order to find some new examples, and also to learn how to design automated lens detection systems to use in the future. I caught up with Jean-Paul Kneib, from the Strong Lenses in the Legacy Survey (SL2S) project, and Space Warps co-PI Anupreeta More to ask them to explain a bit more about it. Jean-Paul, just how big is this survey, and how is it different from the SDSS? CFHTLS is a survey conducted with the CFHT 3.6m telescope using the Megacam camera. It targeted 4 patches of the sky, adding up to about 150 sq deg. That’s about 60 times smaller than the SDSS-DR8 imaging area, but it goes typically 2.5 magnitude (about 10 times) deeper than SDSS, with higher resolution images. The average seeing was 0.6 arcsec, compared to an average of 1.4 arcsec for the SDSS data. So, in short CFHTLS is a mini SDSS but focussed on the deeper Universe, which means it is a great survey in which to find strong lensing systems! Sounds good! Was it designed specially for this purpose, or for something else? What was the original idea? The original design was to measure what we call “cosmic shear” – that is, the tiny deformations that large scale structures produce on the appearance of faint galaxies. This cosmic shear measurement is used to put constraints on cosmological parameters. But similarly the strong lensing systems could also reveal us something about cosmology … but first we need to find them! Sounds good! Anupreeta, you’ve been thinking about lenses for cosmology lately – how are you thinking of using a sample of lenses from the CFHTLS to say something about the universe as a whole? Various cosmological models of the Universe predict different numbers of galaxy clusters at various times, and also differences in how concentrated is the mass distribution within these massive structures. Both these factors affect how efficiently the galaxy clusters will produce highly magnified and distorted arcs. That means that the abundance of arcs in surveys like CFHTLS can be used in turn to understand which cosmological model best describes our Universe. Lens systems allow us to primarily understand the properties -like the mass – of the lensing galaxies. However, it is possible to derive extra constraints from certain types of lenses in order to learn more about the Universe – for example, its age. We see that quasars change their brightness over time; in a lensed quasar system, the different lensed images appear to vary at different times due to the different paths taken by the light rays to reach us. The time delay seen between these multiple images, combined with the speed of light through the lens, allows a measurement of distance to be made. By measuring these time delays accurately, we can measure distance, compare it with redshift, model the expansion of the Universe, and predict its age. I know you’ve worked on the CFHTLS data in the past, with the “Arcfinder” code – what kinds of lenses did you find with it, and what do you think it missed? I mainly looked for arcs in the g-filter since the arcs look brighter in this filter than any other. This helped optimize the arc detection. As the CFHTLS imaging goes very deep compared to SDSS, we found a fainter sample of arcs. In order to contain the number of false positive detections, I had to apply some limits on some of the arc properties such as surface brightness, length-to-width ratio, curvature and area. These limits were essentially decided arbitrarily after some testing on a smaller known lens sample from the CFHTLS. However, it was not known beforehand how this might affect the completeness of the lens sample and the limits on which of the arc properties could be relaxed or made stricter. There are various factors to which a code is sensitive to e.g. 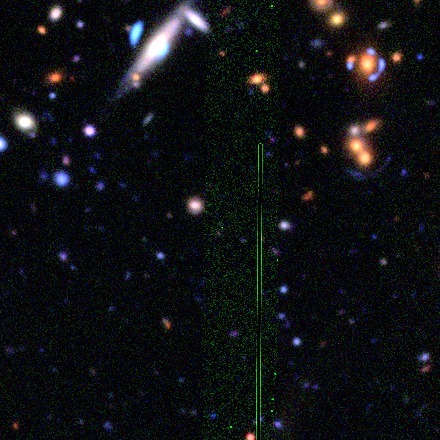 a certain arc may satisfy most thresholds, but will go undetected because it happened to be located in an image region with high noise levels or was partially overlapping with a bright galaxy. People are less susceptible to these fluctuations when they look at images, and can cover a wider dynamic range in terms of arc properties and, simultaneously, assess the likelihood of an arc-like image of being a lensed image, given its color, shape, curvature, proximity and alignment with respect to a nearby lensing galaxy in a way which is not currently possible with Arcfinder code. 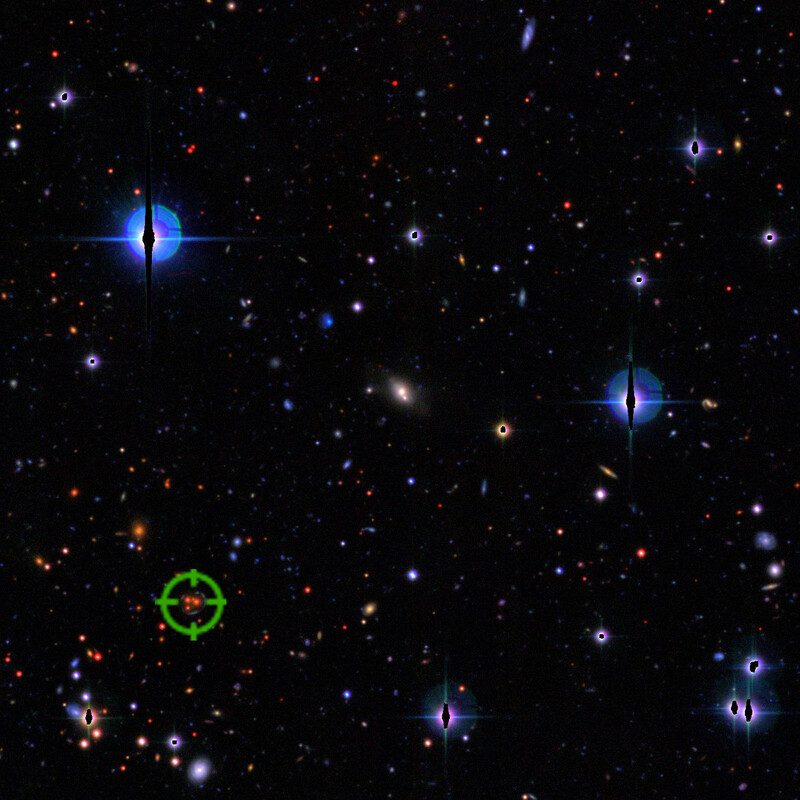 Raphael Gavazzi wrote his “RingFinder” code to look for galaxy-scale lenses in the CFHTLS. That research programme has been quite successful, we found several dozen lenses and used them to study the distribution of dark matter within the lens galaxies. RingFinder only looks at simple, smooth, bright red elliptical galaxies, and then tries to dig into the lens light looking for blue arcs. We expect it to have missed some red arcs, and also lensed features that are not arc-shaped – like the lensed quasars. One thing I am interested in with Space Warps is making a sample of low-medium probability objects: these will be great for testing tools like RingFinder against: can we make it more flexible, and able to cope with spirals, mergers and other galaxies that look like lenses but are not. Anu: have you thought about how the results from Space Warps might be used to improve Arcfinder? That would be cool! The results from the Space Warps are going to be interesting and exciting in many ways. In terms of improving the Arcfinder, Space Warps will provide a more comprehensive library of lenses – I hope the spotters will find the lenses that Arcfinder missed! By measuring the properties of these new lenses, we will be able to put together a better set of thresholds that would have increased the completeness and purity of the Arcfinder lens sample. It might be possible that some new lens properties that we haven’t thought of yet might prove more useful in terms of getting higher purity. It would be great to be able to improve the Arcfinder algorithm in this way. With your help we’re going to find a lot of useful things in CFHTLS, I think!